Meet our CEO and founder, Chef David Melendez a creative entrepreneur from Miami, Florida. 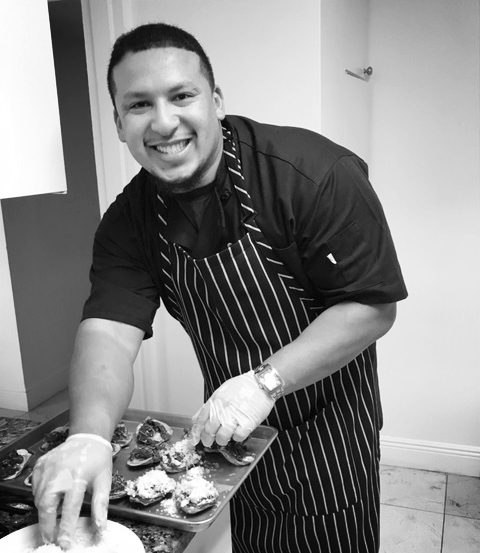 David started his Personal Chef Services in 2013 after honorably discharging from the US Navy and received both his Associates in Culinary Arts and Bachelor's in Food Service Management from the Culinary Institute of Virginia in Norfolk, Virginia. Hire Chef David Personal Chef Services was born to serve the needs of discerning clients craving healthy comfort food on a daily basis. Getting people back to the table enjoying quality time together and having a healthy relationship with food is our core mission. He lives in Miami, Florida with his Beautiful Wife. Chef Norma was born in Honduras and raised in New Orleans and with that she brings strong Hispanic and Cajun roots and many years of cooking experience to South Flroida. She is a perfect fit for the Personal Chef World. In 2013 she graduated from Delgado Community College-Culinary Program. Chef Norma lives in Miami, Florida with her lovely son. When shes not cooking for our amazing clients, she is at home baking and creating amazing pastries for future events.